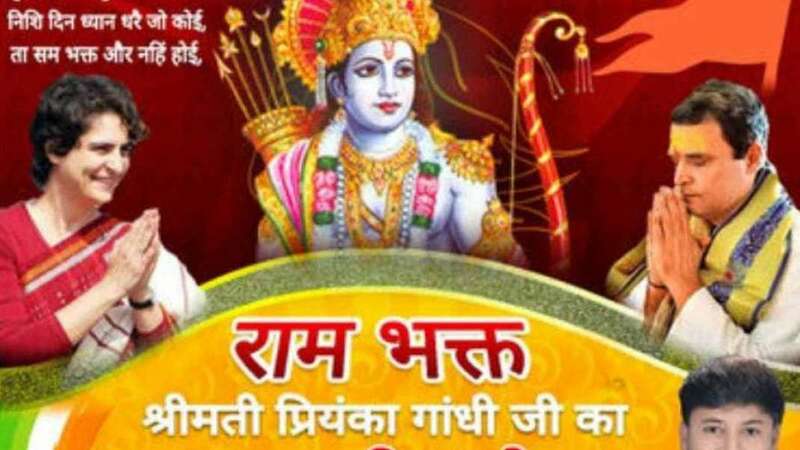 New Delhi : Days before Priyanka Gandhi Vadra is scheduled to visit Ayodhya, posters portraying her as 'Ram Bhakt' have emerged across the city. The posters also feature Congress President Rahul Gandhi on the other side of the poster. Priyanka Gandhi Vadra will be boarding a train on March 27 from Delhi to Faizabad; she will also be holding a road show in Ayodhya and is expected to offer prayers at the famous Hanuman Garhi temple. The Congress leader will board a bus customised in the form of a ‘rath’ and would cover Faizabad, Sultanpur, Amethi and Unnao parliamentary constituencies during the three-day long political campaign on roads. According to a news report, there will be over 30 stops from Faizabad to Amethi. There is no official word from Congress about the itinerary of Priyanka Gandhi Vadra's visit.